I embarked on an unexpectedly charming adventure, crossing continents alongside characters such as Captain Jack Harkness, Toon Link and Zelda, and the X-Men as I tried to stop the scourge of Miitopia, a face-stealing villain so horrifying that few dare speak his name… the evil Dark Lord Monty Burns. This zany, quirky, and mind-boggling addictive little game consumed hours of my life, and proved to be the perfect distraction during the down time on the train to and from San Diego Comic-Con. Miitopia somehow proved to be far more simple of a game than I had expected, but also far more entertaining than I could have ever imagined. The incredibly unattractive nature of Miis aside, the game has great aesthetic. Maps and scenes are laid out rather like construction paper cutouts, lightly textured and layered with bright colors. Upon receiving a divine blessing, you identify your avatar as a personality type, ranging from stubborn to cool to airheaded, and a job, then set off on a merry little your adventure. You’ll be joined by up to three other characters at any given time, who can be custom created by you, downloaded from Mii Central, or even imported from your copy of Tomodachi Life. Your teammates have different dialogue and actions based upon their class and personality, and this is where the real hilarity of the game comes in. Captain Jack Harkness, the cool warrior of our group, tended to toss his hair as he smoothly dodged attacks. Caring cook Toon Link would make meals for his wounded allies, while energetic pop star Jubilee would get so excited about her attacks that she’d do extra damage… then trip over her own feet and hurt herself. The game is littered with all kinds of character interactions which pop up at both expected and unexpected moments. Hilarious character interactions aren’t limited to just those on your team, I watched as a plot unfolded where Ash competed against the foreign Prince Howl for the affection of Princess Serena, as her kingly father, Jabba the Hutt, endlessly stuffed his face with cooked meats. The king’s loyal servant, Iron Man, proudly announced that it was his job to support the king… at least until an evil face-snatcher came along. While most themes of the game run along pretty clear lines of right and wong, it does take a few unexpected twists and turns. I was unable, despite a good three minutes solid of stubbornly chanting the correct spell, to confine the evil, gold-stealing genie Trump to his magical lamp for all time. The game had other plans for this character, much to my disappointment. Anyone who has played Find Mii will find the Miitopia map very familiar. Destinations are marked by dots, with set paths between each point, and traveling to one and pressing the A button allows you to enter that place. With the exception of towns, where you retain control of your character’s movements, your characters will automatically move across any given zone, seeking out enemies, treasure, random events, and even secret paths. The Dark Lord has stolen thousands of faces from across the land, and this heartless cad has given these faces to monsters which you must slay in order to return the good people of Miitopia back to their normal lives. Monsters are randomly encountered, and easily vanquished, either though manually commanding your party, or through the incredibly convenient and surprisingly adequate auto battle system. Defeating monsters not only earns you gold and food (more on food later), but it also earns you special rewards from a mysterious divine helper for every fifty monsters defeated. Characters converse among themselves as they trek along, ever hopeful of finding an inn. Inns mark the end of a zone, and serve several functions. Up to two characters can share a room, and characters who room together naturally grow closer. Forming strong relationships between your characters is an integral part of Miitopia, as this unlocks even more entertaining interactions and provides boosts in battle, while straining relationships can even result in feuds between your characters, hampering your teamwork, and creating very real setbacks in combat. Inns also allow you to give dole out food to your teammates. Each character has specific likes and dislikes, and each kind of food, acquired by defeating monsters, will boost different stats. Food is a great way to customize the stats of your characters, amplifying a strong trait or boosting a low one, though few things are more frustrating than a warrior who loves Banshee Tears, a food item which boosts MP, and hates meat, which increases attack and hit points. Feeding a character a food that they love provides bonus stats, but a character will not get much benefit from eating a food they hate. Inns also allow you to give gold to your characters, who will run off to spend it on a new weapon or clothing–though characters do occasionally get distracted and return with something completely different, like a banana. If you’ve been lucky enough to find Game Tickets, you can also also cash them in at the inn to play one of the two mini games: Rock, Paper, Scissors, which awards you 500 gold if you win, or a kind of roulette, where you can gain everything from new weapons and armor, to fancy getaways for two of your Miis to bond over, to a whole stash of food to… well… a single 1 hit point banana. Those are the risks of gambling, folks. Roving characters also provide additional entertainment. Vegeta served as my quiz master, randomly popping up and challenging me to random trivia, or testing me on just how well I knew my teammates. The wandering gourmet chef, The Rock, often popped up, providing me with free samples of the latest fad food, after raving about their flavor, mouthfeel, and bouquet. There was also a character who begged me to show her different Amiibos, promising me rewards if I did so, but alas, I am a sad individual without a single Amiibo to my name, so I was unable to explore the bonuses unlocked by this feature. While the mechanics are simple, the combinations of jobs, characters, and personalities proved to be surprisingly entertaining, and I was shocked to find just how much I cared about how the fictional characters on my team behaved. While Jack Harkness laying on his side and announcing “Hello, Doctor,” whenever he won, and Toon link shouting, “No, YOU listen!” whenever he performed a critical hit were perfect, I found that the the Cat job class simply didn’t fit Kurt Wanger, better known as Nightcrawler, and spent an obscene amount of time transforming the Mii into Kyle Gibney, WildChild, a far more obscure Marvel character who seemed more suited to the role. I expected Miitopia to be a glorified StreetPass game, and was surprised by how entertaining and addictive it turned out to be. I can’t say it’s the best game I’ve ever played, but I simply could not stop playing it. I found myself staying up late or blowing off a project just so I could play one more map, see one more interaction at the Inn, or upgrade my teams armor one more time. This adorable game somehow hits all the right buttons, having struck a magical combination of being ridiculous and hilarious while still offering enough complexity in job classes, characters, plot, and an inviting, mostly hands-free gameplay which makes it nearly impossible to put down. Regardless of if you’re populating your game with Miis representing your best friends or your favorite fictional characters, you’re in for a treat of an epic adventure in Miitopia. Miitopia is an irreverent, hilarious casual RPG which is nearly impossible to put down. With the ability to create your own characters, import from Tomodachi Life, or pull premade characters from Mii Central, your game is certain to be full of a diverse group of characters from all across popular culture. This full length game has a charming aesthetic, an expanding story and a huge map to explore. 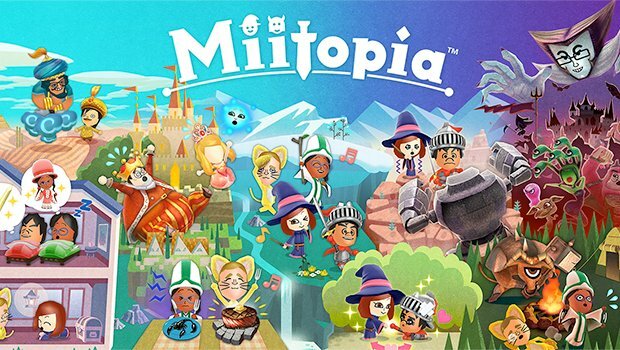 Endlessly silly, strangely addictive, and easy to play thanks to the auto-battle feature, Miitopia is a delightfully ridiculous game which is perfect for the casual gamer in search of a reason to smile.